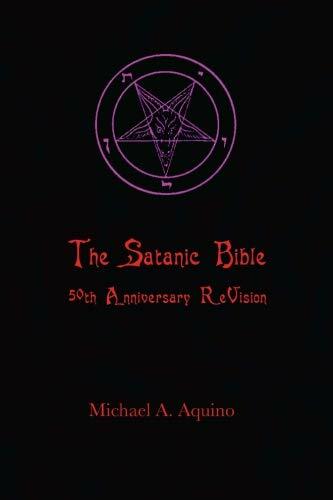 NOTE: The Satanic Bible is available in four editions: premium black & white paperback $18, hardcover black & white $30, premium full-color paperback $75, and full-color Kindle ebook $6.66. The paperbacks and Kindle are options here; for the hardcover is a Lulu publication. When Anton Szandor LaVey published his original Satanic Bible fifty yers ago, it was an angry book - and it had plenty to be angry about: It confronted a humanity which for more than two thousand years had been taught to hate itself, fear God, and hide from a threatening, very un-Edenic universe around it. Even worse, humans were told they were not only originally-sinful and imperfect, but imperfectible - except, perhaps, through the intercession of an Islamic Mohammed or Christian Jesus, demanding absolute abasement and obedience. With men and women reduced to naked, shamed animals, therefore, Anton saw and argued in his Bible that the only solution was to be the strongest, craftiest, and most hedonistic animal âin the valleyâ. It was a prescription of power and vengeance to delight an Ayn Rand or Orwellian OâBrien. But then, in the 10-year exoteric crucible of the Church of Satan, followed by the 40-year esoteric one of the Temple of Set, we discovered that humans not only had nothing to be inherently ashamed or guilty about, but that indeed we are self-perfectible; and that Black Magic enables us not just to decipher and harmonize with the Objective Universe without, but to discover the Subjective Universe of divine immortality within. So this is not an angry Satanic Bible. It is one of excitement, exuberance, the delight of virtue and nobility for their own sake. The cosmology it reveals and the Black Magic it teaches are not weapons to hurt but tools of divine enlightenment and transformation. Your eternity begins now.